Everyone loves the savory and assertive flavors of Chinese fried rice. Well, this Chinese style rice is similar to fried rice from a flavor perspective – however it is technically steamed rice. 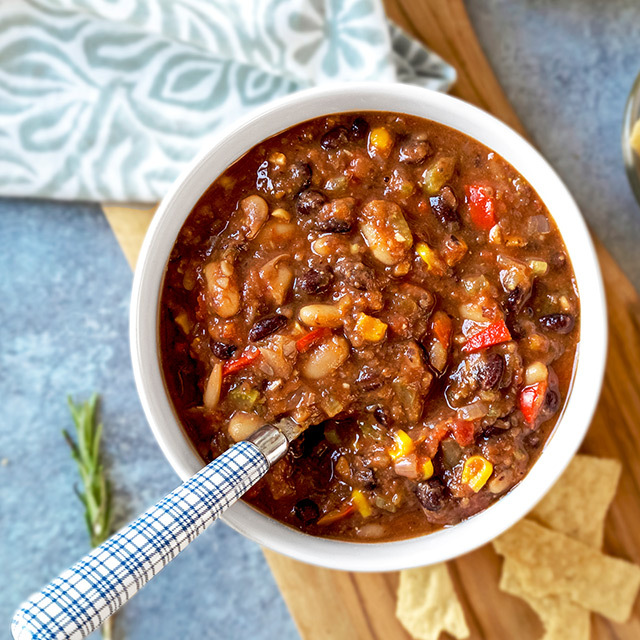 Since we’re using a multi cooker (rice cooker) to whip up this bit of yumminess, there’s no need to break out the frying pan at all – or even turn on the stove top for that matter. However, since we’re using super flavor forward ingredients in our rice mixture – like sake, sesame oil and soy sauce in a soup based cooking liquid – you’ll be hard pressed to tell the difference between steamed and fried. The best part about making this corn studded steamed dumplings recipe (aside from the flavor) is that you can steam these dimsum favorites at the exact same time you cook your Chinese style rice. Your Tiger multi cooker is up to the task! Simply load all the ingredients for your Chinese style rice in the inner pot – and then carefully place your corn shumai on top of a layer of cabbage in your Tacook plate. Use the Syncro-Cooking setting, press Start and that’s it! Your rice cooks perfectly in the pot below while the cooking steam works its magic on the dumplings in the tray above. Yep, It’s fair to say that EASY and DELICIOUS are the key takeaways from this shumai and Chinese rice recipe. Ah, steamed dumplings… how we adore you. We’re absolutely powerless when the dim sum cart rolls past and tempts us with your juicy perfection. And whether you prefer Chinese pork dumplings (Shaomai – 烧卖), or are more into the shrimp loaded Japanese version (Shūmai – シュウマイ) – you just can’t go wrong with perfectly steamed, savory parcels of mouthwatering goodness. It’s especially wonderful when you can cook your shumai at the exact same time (and in the same machine!) as a veggie and pork loaded Chinese style rice! Yep – dumplings in ALL forms are pretty special things. And it’s in the spirit of inclusivity that we share this fun and delicious recipe for corn shumai and Chinese style mixed rice. Mix the ground pork, onions, dried shellfish, ginger, sugar, soy sauce, salt, potato starch, sake, and sesame oil. Take 1 tbsp of the mixture and form round balls. Securely attach the corn and okra to the surface of the balls. Line the balls on top of Chinese cabbage on a tacook cooking plate. Place the washed rice in the inner pot and pour in Chinese soup up to level 3. Lightly mix together the pork, burdock root, carrots, ginger, shitake mushrooms, sesame oil, sake, soy sauce, salt and sugar in the inner pot. 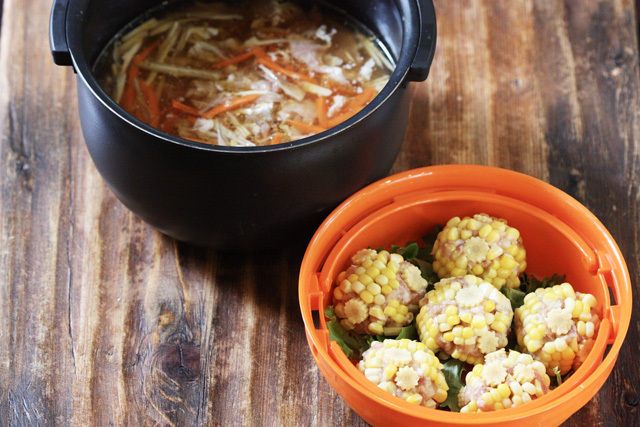 Place the tacook cooking plate with the corn shumai (dumplings) and the inner pot in the rice cooker. Select the “Synchro-Cooking” menu and press the start key. When the cooking is complete, stir the rice. 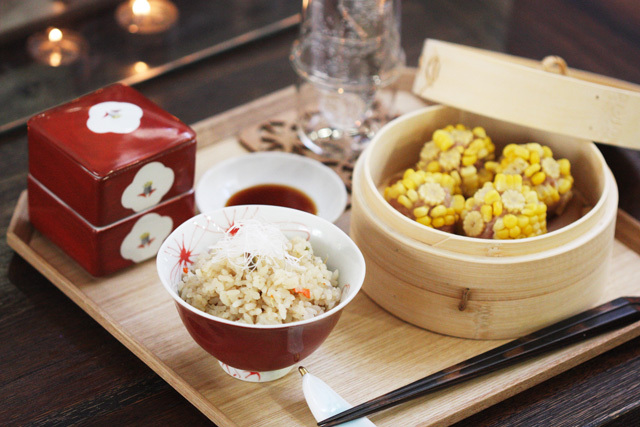 Serve the corn shumai steamed dumplings together with Asian-style mustard (karashi) and soy sauce as desired.